All photographs in this post are by Hillary Younger. Jan: Tasmania is a rather small island far far away for lots of people and photographers. Yet one an area that equals West Virginia or 20 percet of Germany, it shows a great diversity of spectacular landscapes. 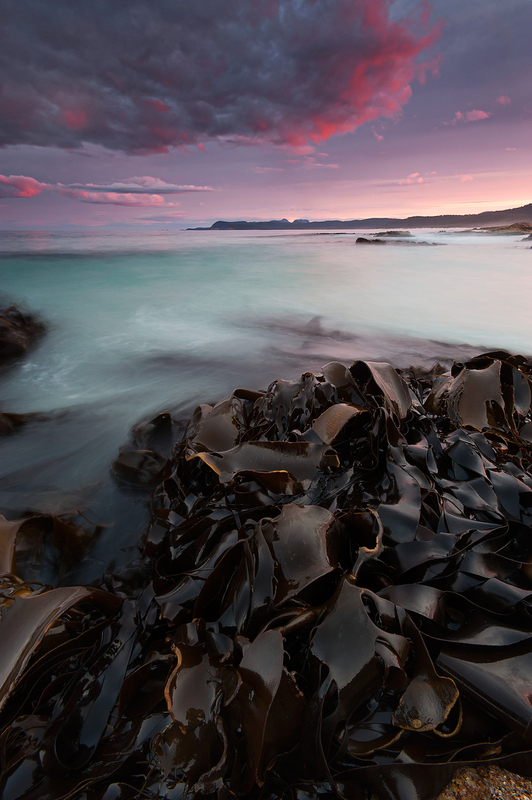 How would you introduce Tasmania to outsiders interested in the natural treasures? Hillary: The insularity of Tasmania and of the Tasmanian Wilderness in particular, has contributed to its uniqueness. Its remoteness and low population have contributed to an island rich in pristine environments, with little or no sign of human presence. And being an island in the southern ocean contributes to a diversity of weather patterns, and hence landscapes. The coast is diverse in itself from the rugged west coast, pounded by the wild seas and winds in the path of the Roaring Forties, to the milder east coast with vivid orange-red lichen adorning the rocks, and the spectacular pink granite cliffs and mountains of the Freycinet Peninsular, and then the Tasman Peninsular with some of the tallest sea cliffs in the world, and the recently opened multi day Three Capes walk, around those incredible sea cliffs. Although a small island, the Tasmanian Wilderness is one of the largest conservation reserves in Australia. At approximately 1.6 million hectares it is one of the three largest temperate wilderness areas remaining in the Southern Hemisphere. It has a highly varied flora, ranging from open and closed forests through to buttongrass moorland and alpine communities, occuring in a unique mosaic of Antarctic and Australian elements. The Antarctic element consists of species descended from those present on the supercontinent Gondwana. Some of the longest lived trees in the world such as Huon pines (Lagarostrobos) and other native conifers grow in the area. Nothofagus is an ancient plant genus of Gondwanan ancestry and Australia's only winter deciduous tree. It is a photographic mecca in it's full autumn glory, in the rugged alpine areas where it is found. The landscapes of the Tasmanian Wilderness contain rocks from almost every geological period, the oldest being formed about 1,100 million years ago during the Precambrian period. Some of the deepest and longest caves in Australia and other spectacular karst landscapes are found here. The fauna is also of global significance because it includes an unusually high proportion of endemic species and relict groups of ancient lineage. The diverse topography, geology, soils and vegetation, in association with harsh and variable climatic conditions, combine to create a wide array of animal habitats. Many groups of marsupials and burrowing freshwater crayfish have survived as relicts of the Gondwanan fauna. There are plenty forest ecosystems on our planet. What is special about Tasmania's forests? As alluded to already, Tasmania's alpine ecosystems are unique, with over 60% of all species being found here and nowhere else on Earth. Most of Tasmania's ancient native conifers are found nowhere else and include species that are among the longest-lived organisms on Earth. These are relics of Gondwanaland, and are not part of the fire resistant ecosystems which predominate in Australia. They include Pencil pines and King Billy pines which live for 1500 years and are found nowhere else on the planet. As well as the deciduous beech, which turns alpine terrain orange, gold and red, in it's full autumn colors. These trees are all are extremely fire sensitive and are killed outright and their seed destroyed by fire. Fire also burns and destroys the deep peat soil, accumulated over millennia, that the trees grow within and are dependant upon. Once burnt they are gone. And even if some seed survives, they are incredibly slow growing. Some of Tasmania's alpine areas have not seen fire since before the last Ice Age, which ended 12,000 years ago. Can you share a personal story about how out feels to wall among these precious trees to photograph the landscape they grow in? I have so many experiences that I hold dear. The alpine areas of the Walls of Jerusalem in the Central Highlands are the ones immediately under threat from fire, and also the ones where I have some of the deepest memories. I have always tuned to nature of healing and regeneration. Spending much of my childhood alone in wild places, has perhaps led me to feeling at peace when alone in the wild. I gain something in this solitary communion with wild nature that is worth the added risk of venturing there alone. A few years ago I celebrated one off those milestone birthdays, sleeping under a stand of Pencil Pines over 1,000 years old. Alone and quiet, I see animals that would otherwise stay hidden. Here, I've sat on a log astride a stream and watched shy platypus swimming under and around me. Wombats have ambled past with their young. In those moments it is possible to still your restless self, and open to simply being. Intuit the interconnections between the living world around. And find sometimes meaning...and awe. The perseverance of life in a harsh environment. The hope inherent in that. Other times I have been caught in storms there, picked up (with 30 kg backpack) and thrown sideways by raging winds onto leg-braking boulder fields. On walks to photograph untouched areas, through rainforest that has never before had a human presence....the first hand to touch a tree, to lie on that patch of ground. Areas of rainforest where even aboriginal people did not come. The hardest walk I ever did was a 3-day hike into untouched rainforest, no track, crossing a raging river in which I nearly drowned. Of the 7 hour walk in, maybe 30 minutes was walking. The rest climbing, crawling, sliding, falling. But emerging exhilarated, so uplifted by a fully wild place, totally untouched. Until now this could have been a story of "paradise found", but sadly we have tell a story of "paradise lost" after what had happened in the last days and weeks. Can you describe how you experienced these times? What happened exactly? "At the time of writing, two weeks later, a 60km fire front extends south and west from Mawbanna in the North-West of the island, raging unchecked through heathland, woodland and rainforest at the very edge of Australia’s largest rainforest wilderness in the heart of the Tarkine. At Lake Mackenzie and Lake Bill on the Central Plateau ancient pencil and King Billy pines have been burnt and fire threatens the last remaining large stand of pencil pines, a majestic forest at Dixons Kingdom in the Walls of Jerusalem National Park. The fire burning out of control on the February Plains threatens Mt Ossa, the Pelions and the DuCane Range, the mountain stronghold of Australia’s only winter-deciduous tree, the deciduous beech, or fagus, and home also to venerable native pines. 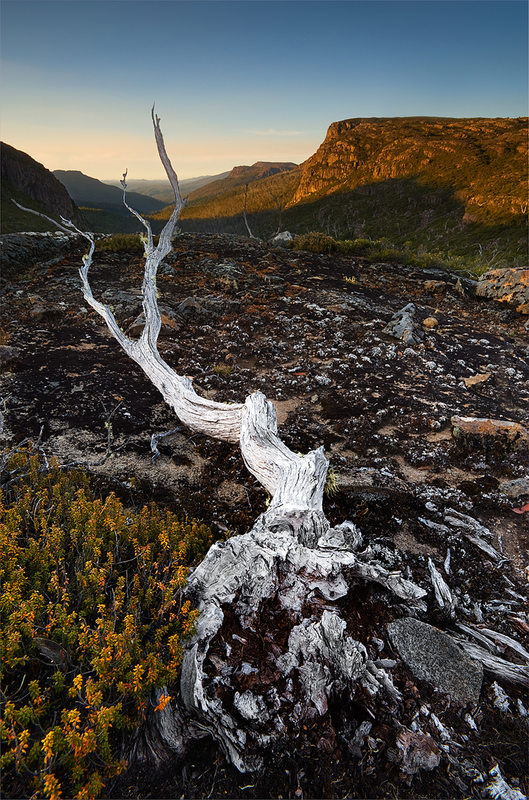 In the South, the fire at Mt Wedge burns directly upwind of Mt Anne; with its King Billy pine rainforests and unique tree-line pencil pine and cushion plant communities, made famous through the photographs of Peter Dombrovskis. These fires, and others still burning, have caused massive and in some cases irreparable damage. In hot, windy weather they threaten catastrophe." Even though we have now had some rain in the state, many of those fires are still burning, and more were ignited by further lightning strikes. So we are not over this danger yet. The emotions are of heartbreak, loss, grief, intense sadness. And yes, some anger. I read that someone compared the fate of the Tasmanian forests with learning that a loved one has been diagnosed with cancer with no chance of healing. What are your emotions connected with these places and the presumed loss? Although change is the nature of life, the changes to our climate are happening at an unprecedented rate, resulting in dramatic events and losses. But, unlike a cancer with no chance of healing, there is still hope. Even after the current crisis has passed, it is abundantly clear that this is a new reality. Increasingly dry conditions, and storm activity will create further fires in the years to come, with increasing intensity, and into areas unadapted to them. The only way to preserve the tracts of unique rainforest and alpine wilderness that we have is to have an immediate and effective response to fire. And to prioritise these areas, rather than letting fires burn unchecked for days. In which way would you say your emotional connection is shaped by photographing the places? For me, the emotional connection came before the photography. The photography is a way of expressing and sharing the connection. And certainly an ever increasing drive to be out there, in special light, and at times when others are not. There is something incredibly magical about waiting alone in the dark, in a wild place, and watching the light slowly come onto that land, in all the hues and subtleties of a beautiful dawn. In that sharing, especially of moments of deep connection and intimacy with the land, there is always the chance that it will speak to whoever views that image. That there will be even one more person who understands an inkling of how important it is in our own existence, to connect with the natural world. Like at Mt. St. Helens there we'll be a new ecosystem established at the burned lands. Although it can't bring back what is lost, h does this thought comfort you in any way? It is cold comfort. Because what regrows is vegetation with high fuel loads, which will burn hotter and more readily, exposing adjacent vegetation to even greater risk of incineration. The long term prognosis for the Gondwana forests is very poor. That is a deeply sad thing. To be in a forest of trees over 1,000 years old is something else. It is hard to communicate that in mere words. That ancientness. That sense of being, and of yourself as just a blip in time. Apart from the passion and grief, I also sense a lot of anger connected with the events. Could this tragedy have been prevented by human interference? I certainly feel a sense of anger. I heard a very passionate and wise friend of mine, who had the courage to go and document the destruction, say that he was not interested in blame. But in a more effective future response. I would agree with that. The anger in me is at a perceived inexcusable delay of at least 10 days between the ignition of the fires on January 13 and the government calling for interstate help (which it seemed obvious would be needed from the start). A decision was made to let the fires run their course in very fragile irreplaceable ecosystems. Help was called for far too slowly. The media coverage was pitiful. Two fires joined in to one fire in the Tarkine and grew to over 36000 hectares. If dealt with promptly this possibly could have been kept to 3% of that size, or even less. These are lightning strikes, they start very small. The lack of urgency and even lack of visibility and comment from our Tasmanian Premier and Federal environment minister is appalling. Is there a perspective for help from people like you and me right now? Is there anything more that we can do than shedding light on the events? One thing has already begun, and that is the documentation of the destruction in the wake of the fires. The other is to spread this awareness, this story, as far as possible. Public opinion is a powerful thing when harnessed which can pressure governments into action. This fire and threat is a direct result of climate change. And yet there persists a mentality that this is just natural events. As if the status quo can continue, and all will be as it should. In a more general way, what could and should landscape photographers do facing climate change? Can you imagine anything that a single person or a group of enthusiasts could actually do? As landscape photographers, as well as humans on the planet, I believe we have a responsibility to these natural places we frequent and ultimately use in our quest for beauty and for some photographic trophies. Shedding light on the events is the response to this single event. Working with conservation wherever we are, putting our images towards education and awareness, as well as furthering our own personal ambitions and businesses, would be something incredibly positive, if it was adopted by landscape photographers en mass. Photography has been the fastest growing hobby in the world. It would benefit everyone, if that rising hobby went in tandem with rising consciousness and awareness of the world in which we find our imagery. Joining with other photographers, artists, people with shared values, to act together can be a positive and ongoing force. In Tasmania, a photographer and film-maker, Dan Broun, started a project called 'Tarkine in Motion' in response to the threat to the Tarkine Wilderness by mining, logging and destructive use of off-road vehicles. This involved over 70 artists of multiple disciplines, coming together one Easter at the Tarkine to create, inspired by that place. The resulting exhibitions, festivals of music, film, books, are ongoing and creating awareness of the need to have this place declared a National Park and protected. It is a shining example of what can be achieved when people work together for a place. On a personal scale, photographic workshops can teach not only the technical and artistic aspects of photography, but also connection to place, and an awareness of our impact on the natural world. Finally, not to end on a bad note, convince me to come to Tasmania even after the fires. Jan, there are still large tracts of ancient Gondwana unburned, where you will feel that you are truly, deeply in wilderness. Another world, another time away. There are the tallest sea cliffs in the southern hemisphere, now accessible on a world-class multi day walk. There are day walks to waterfalls, and multi-day hikes in stunning wilderness. Pristine white sands and turquoise waters, pink granite cliffs and lichen studded coastal boulders. I can be on a mountain in the morning and shooting a seascape in the evening. And 30 minutes from the capital, on a surf beach alone. More than anything else, here I can be alone in a truly wild place. Hillary Younger is a landscape photographer based in Tasmania. Born in the northeast of the island, she started exploring the natural treasures of her home in childhood days. After some years of travelling and living overseas, she returned to Tasmania for it's remote wilderness areas. Together with creative partners Daniel Greenwood and Jason Mordecai she just launched the Luminary Light Collective.